The Shining Girls by Lauren Beukes, HarperCollins, 2013. In an article on her play The Free State: A South African Response to Chekhov’s “The Cherry Orchard”, Janet Suzman explains her reason for localising a work whose universalism she thereby avows. “Probably,” she hedges, letting us pause to conjure the fragrant bedrooms of the gentry, “you cannot even begin to write a play about a country until you know the call of the first bird outside your window when you wake.” And yet, even this appeal to a national genius loci is a stretch: there’s not much birdsong in Hillbrow, as there are no orchards in Red Square. Cast in terms of simple geography, then, the old student adage to “write what you know” delimits a very small terrain. Fortunately for her career but less auspiciously for the fate of “global” literature, this is not advice that the Cape Town-based Lauren Beukes seems to have taken much to heart. 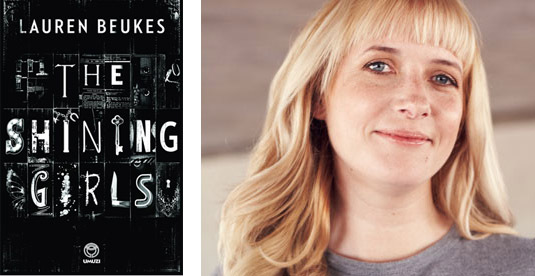 Her new novel The Shining Girls, released simultaneously in the U.S., the U.K., South Africa and Australia, and set to be published in sixteen languages, follows a time-traveling serial killer around Chicago between 1929 and 1993 (think Dexter meets Doctor Who with a newspaper room thrown in for good measure). Beukes juices almost 400 pages out of a place which, though I grew up a two-hour flight away from it, means little to me other than flavored popcorn, dirty politics, and a very big lake. She’s both imaginatively audacious and imaginatively naïve, which makes this novel an ideal diagnostic tool for the ambitions, or ailments, of fiction in a hyper-connected era. On the surface, The Shining Girls departs from both the models Beukes cites for global writing: “I want to be a David Mitchell; a Margaret Atwood,” she said recently to Ashraf Jamal in the Mail & Guardian. While Mitchell and Atwood are both acclaimed science fiction novelists with mass appeal, Beukes elides a crucial difference in their orientations to their form. Atwood’s futuristic, dystopian vision of an ideologically polarised America in The Handmaid’s Tale upholds novel-writing as fundamentally a critical enterprise, whereas David Mitchell’s “connectivity fiction” – Ghostwritten, for example, which spans nine locations from East Asia to Russia to the U.K. – is largely redemptive. By this I don’t mean that Mitchell doesn’t deal with difficult topics (terrorism in Ghostwritten, slavery in Cloud Atlas), but that his efforts to derive meaning from chaos lie in the books’ erratic and interlinked structure. He is the transnational writer par excellence in both a textual and market sense, whereas Atwood invents a particular new time and place to critique one we’ve got. The Shining Girls, seen in this light, can’t make up its mind. It confines itself to a fixed locale so that it can jump from era to era, movie set to movie set, disemboweled victim to disemboweled victim. But it has neither enough depth nor enough scope to innovate, or for that matter, to entertain. Beukes’ well-accessorised hipness – the book is full of vintage props like lighters and My Little Ponies – gives it a sheen of cultural access that does not carry through to her feel for where it takes place. Chicago becomes a façade for locality without asking the reader to do the work of inhabiting one, and absent the risk of real idiosyncrasy there’s no possibility of giving oneself over. We’re told that it’s Capone’s town in the 1930s and by the 90s we get some descriptions of urban decay, but “shabby jazz joints” and “ragged children” could be a lot of places. References to local institutions like colleges and media outlets stand in for any felt sense of what those institutions mean, but one suspects this is the point. The setting is as spectral as the prose itself, which is fully of-the-moment in inviting anyone from anywhere to project onto it. This might be a trade-off worth making if the novel’s descriptive sprawl were up to its temporal one, if the writing itself had a sentence-level flair and variation that allowed us to enter new “worlds.” That the killer finds his victims as little girls and then travels through time to carve them up as adults would seem to suggest, at the very least, a desire to experiment with the evolution of speech, of vibe, of characters’ relation to their surroundings; to use them, in effect, as canvasses for Beukes to hone a more expansive voice. But The Shining Girls is too often transparent in its bids for the taut and atmospheric, and lacks the precision that might redeem its shallowness with style. Its first few sections are cluttered with references to heavy breathing and captive animals, namely a bumble-bee held hostage in the book’s first scene by its heroine, encountered here as a child. “Well isn’t she tough!,” we say to ourselves as she holds the insect down to play circus. A strange man joins her and kills the bee, foreshadowing a pivotal and overdone animal-death scene later in the book. And yet there doesn’t seem to be much self-consciousness about linking the novel’s design to these generic tropes, save for one half-hearted joke about valiant pets that lets the author off the hook. Except that they don’t. Besides Kirby Mizrachi, the main character, there’s an array of cardboard Polish-Americans, Korean-Americans, and African-Americans, in supporting roles. They think things like (in the case of a hot young architect), “For God’s sake, she’s not even a socialist, let alone a member of the Communist Party. But she’s artistic. And these days that’s bad enough. Because artists socialise with all kinds of people. Like blacks and left-wing radicals and people with opinions.” The defining feature of all these feisty young women is that they are feisty young women, and the moral seems to be that these come in all stripes and shades and should be allowed to flourish. But who would disagree, when there’s nothing harder than that to have to swallow? Like in Ghostwritten, this function of “mapping” a concept, be it globalisation itself or women stamped out violently through time, results in portraits so hackneyed as to border on offensive. (I’m thinking especially of The Holy Mountain section of Mitchell’s 1999 novel, a composite sketch of stereotypes about Asian female victimisation and spirituality.) Beukes’ attempts to channel black American voices, especially young, male ones, sometimes reminded me of white people parodying Ebonics at my middle school in the 90s. This is avowedly not The Wire, in other words, but nor can it lay claim to rivaling more decadent and well-wrought Showtime fare. And so I end up back where I started, with comparisons to things that aren’t books, as a means of ferreting out what The Shining Girls does. Its killer sums up my fear that this mission is doomed, though, when he says that we read life in “A desperate attempt at order because we can’t face the terror that it might all be random.” As we fritter and fret over the globalisation, nichification, and Twitterfication of literature, concocting all manner of schemas to make new media and new writing seem aligned, perhaps we read too much and delve too little into case studies as tailor-made as Beukes’ novel. For surely the task of any criticism worth the name is not just to point out what’s new, or big, or genre-bending, but to ask to what end? If the answer isn’t insight, isn’t challenge, isn’t craft – if it isn’t even that much fun – then our questions need revising.